Former Liberal finance minister Dwight Duncan says public services are in jeopardy, sings praises of controversial public-private partnerships. 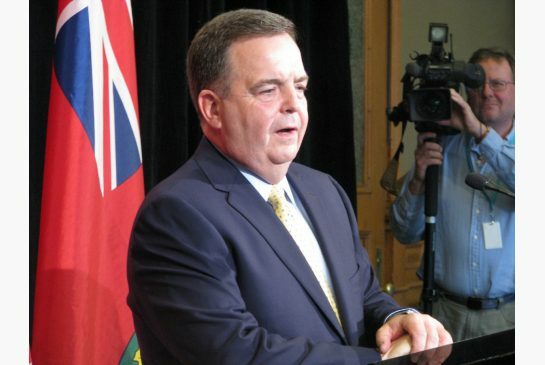 Former Ontario finance minister Dwight Duncan is singing the praises of controversial public-private partnerships. While he was cautious about the idea when he was treasurer, Duncan said Thursday the province must partner with the private sector if it hopes to preserve public services. Duncan is the co-chair of an advisory panel for a special report, Unlocking the Public Service Economy in Ontario, released by the Ontario Chamber of Commerce, MAXIMUS Canada and KPMG. “Ontario’s debt is approaching $300 billion. Our infrastructure is insufficient, gridlock is gripping our most populous region and our aging population is about to drive up health care costs exponentially,” Duncan said in release prior to appearing at Queen’s Park for a news conference. “We believe there’s room for productivity improvements within government that can be gained through alternative service delivery,” said Duncan, a senior strategic adviser at McMillan LLP. The 39-page report says many countries that have joined hands with the private sector have saved more than 20 per cent in service delivery costs by employing alternate models in areas such as prisons, health services and administrative services. Alternative service delivery refers to the process of public sector restructuring in which governments partner with the private or not-for-profit sector to deliver public services. The report says areas most suitable for partnerships in Ontario are areas of service delivery, including health care billing, issuing drivers’ licenses and outpatient medical procedures. “Despite international successes, Ontario lags behind many other countries when it comes to adopting innovative alternative service delivery models,” said Allan O’Dette, President and CEO of the Ontario Chamber of Commerce. Despite McGuinty’s musings about merging Ontario Power Generation, Hydro One, the Liquor Control Board of Ontario and the Ontario Lottery and Gaming Corporation — and a secret “white paper” studying the scheme — the government backed away. The Liberals have for decades squandered and continue to squander Billions of dollars by the use of private Corporations to administer the Secret Police Powers of Child Protection Services through the 54 unaccountable private corporations called the Children's Aid Societies of Ontario. This has created a Criminal Cartel that employs criminals like Marguerite Isobel Lewis , a lawyer for the Children's Aid society of Ottawa who personally fabricates evidence to abuse children and protect the most violent of child abusers for no other reason than the perpetrator of extreme unprovoked violence towards children and partners happens to be female. The Children's Aid Societies believe in "Gender Superiority" and devote billions of dollars to providing unlimited litigation services for the most violent of female child abusers. It's no wonder that lawyers openly refer to them as "The Gestapo". The Liberals have created, supported and entrenched a Criminal Organization that costs Canada Billions of dollars not to mention terrorizing and destroying anyone and everyone in their path. Ontario can wipe out Billions of Dollars of wasted government funds by scrapping the Corrupt Children's Aid Societies of Ontario and replacing it with fully accountable Dept of Child Protection. Ontario can wipe out Billions of Dollars of wasted Government funds demanded and given by Police Forces across Ontario for their Promotion of Hatred towards fathers, not to mention the promotion of Domestic violence towards fathers. Ontario can wipe out Billions of Dollars off Wasted Government Funds by demanding reform to the Judicial Selection Process that appoints the most corruptible and the most unsuitable lawyers to be judges in Ontario. Specifically, at present, Ontario appoints lawyers who are FORMER lawyers for the Corrupt Children's Aid Society who go on to rubber stamp what ever this "Gestapo" cartel requests. Ontario can wipe out billions of Dollars of wasted Government funds by terminating extreme Feminist Crown Attorneys like Vikii Bair and Tara Dobec who spend their lives cluttering the criminal courts with prosecutions against male victims of domestic violence while STAYING charges against the female perpetrators of unprovoked violence towards children and fathers. Stephen Harper and his family are entitled to privacy and a presumption that nothing improper occurred unless there is evidence to the contrary. The problem in Ottawa is that we have a Corrupt Ottawa Police and corrupt Children's Aid Society who promote violence against fathers unless of course, your happen to be a father and work for the Corrupt Evidence Fabricating Children's Aid Society of Ottawa or are a member of Ottawa oligarchy of power. Now Stephen Harper should take careful note of the incredible Abuse of Children by those with the Power of God in Ottawa such as Robert Godman, and the Evidence Fabricating Pathological Liars like Phil Hiltz-Laforge and Claudette Knuckle-Dougan who ignore children's disclosures and virtually any disclosure of violence and or abuse by a parent to a child as long as she is a mother, and, that they put any sort of fabricated claim that unprovoked violence against children by a mother can all be stopped if the non-violent protecting father is removed from the picture. Phil Hiltz-Laforge and Claudette Knucke-Dougan can fabricate evidence with impunity. MARGUERITE ISOBEL LEWIS, who will turn denials into an admission. Worst of all, Stephen Harper might like to meet one of the most ruthless child abusers in Canada. A Former Lawyer for the Children's Aid Society Timothy Minnema who personally fabricates like Marguerite Isobel Lewis, admissions when denials were made. While Ontario employs such professional criminals who fabricate evidence to abuse Children, our society will continue to incur costs of Billions of Dollars of Taxpayer money that is spent on the Extreme Feminist Agenda of promoting Violence against fathers. Stephen Harper should call up the Ottawa Police and ask why is it that they still employ a Detective Peter Van Der Zander who personally fabricates evidence to protect from charges one of the most violent perpetrators of unprovoked violence against children and partners including attempted murder by strangulation where the Police noted the father was bleeding from cuts around the neck.